cincinnati, disability, possibilities, trials, triumphs, friendships, etc. This is local research, done by Jack Pealer. Jack has lived and worked in Ohio for a long time. He learned about person-centered approaches and SRV in the 80’s and has been one of our most informed and thoughtful voices for inclusion ever since. He has helped me personally a great deal in understanding what all of us are up against together in this effort. Back in the early 90’s, Jack asked 51 people with the label of disability a simple question: “Who is in your life?” This is the result of that research. Does this look like my life or the life of most people without disabilities? Has anything changed in the past 20 years to improve this picture? 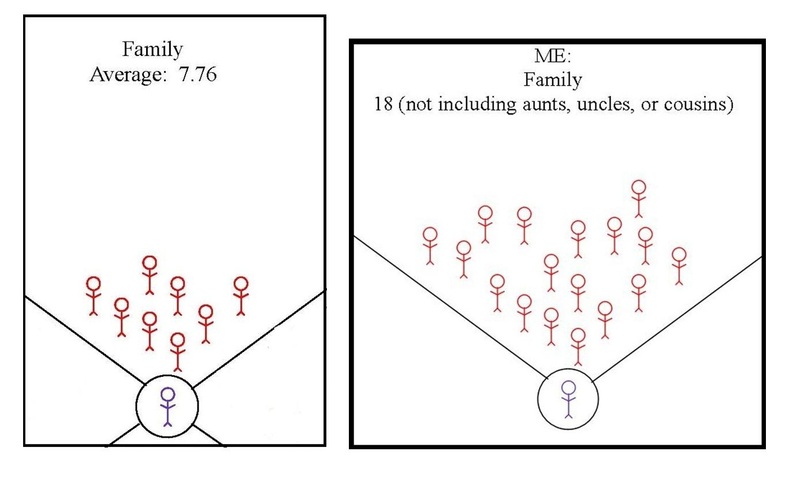 So in the research, Jack found that people had about eight family members in their lives. That seems about right to me. Many of us have lots more family, and we may have a lot of extended family that we can name, but may not see often. And we can count in-laws, which double the numbers. 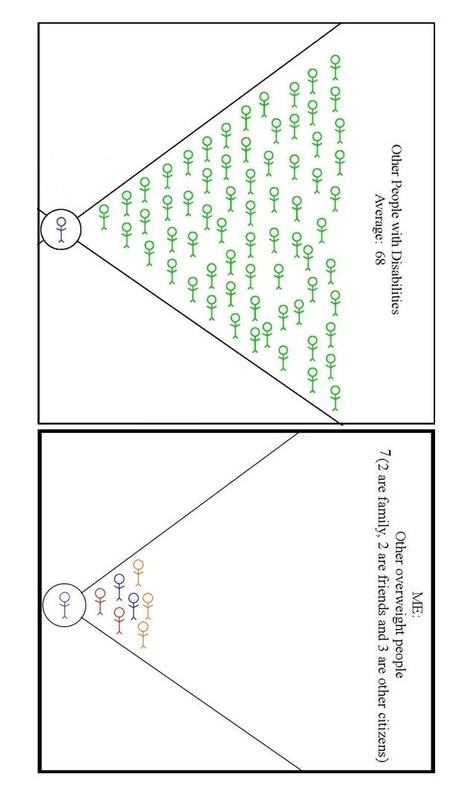 But overall, I think this seems in line with what I consider to be my “close family.” If my prospects for marriage were as slim as those of us who have the label of disability, I would have around 8 family members in my life as well. Since I’m married, I have twice as many. 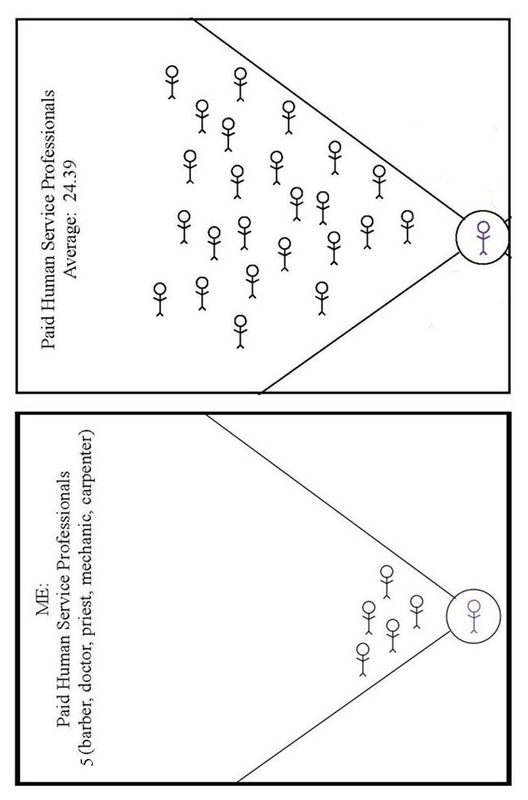 In the next part of the graph, we see how many “Paid Human Service Professionals” are in the lives of the 51 people. These would be people like group home support staff, staff from places like Starfire, day program staff, teachers and others who are paid to be in the lives of people with disabilities. When I think of the people I pay to be in my life, I think of mechanics, carpenters, doctors, and the barber. You could also think of hairdressers, landscapers, lawyers, accountants and bus drivers. I have those kinds of people in my life, just as people with disabilities do. …there’s waaayyyyy more of them. Kathy Wenning has helped me really understand the difference, though, between the people paid to be in my life, and the people paid to be in her son Joe’s life. In my life, I have power over these people. I can fire them if they don’t do a good job. In Joe’s life, these people have power over him. They build the programs, they make all the decisions, they fill the calendars and hold the purse strings. They may say that Joe gets to choose, but in most cases, Joe is simply choosing from a menu that they have created for him. I also get to pick who these people are…I hire them. I decide if I want to pay a lot for quality, or if I want to go for the cheap option. But Joe has these people hired by managers for him. The quality of their training, attitude and the level of care is completely random, depending on the staff, their supervisor, and the agency. Joe also can’t choose whether his favorite staff decides to take another job or gets promoted out of his life. In my life, these people also play a very small role. I may interact with them anywhere from one to four times per year. Even if I had a therapist that I saw once per week, it would only be for an hour, and it would be limited to a set number of sessions. So if they were promoted or moved away, it wouldn’t be a big loss to me. For Joe, these people are a big part of his life. When he moves out of his parents’ home, he’ll probably be in contact with a paid person every day for the majority of his waking hours. So we may have paid people in our lives, but those of us with the label of disability have a lot more of them. And if we have a disability, chances are the paid people exert more control in our life. Big differences, huh? The 51 people reported having an average of 2.41 friends without disabilities, and 2.75 “other citizens.” We can assume that these “other citizens” might be neighbors or people from church, perhaps. This is where my life and the lives of these 51 people starts to really look different. I have over 700 “friends” on Facebook. I would say that about 50 of them are actively involved in my life. In addition, I have another 50 or so “other citizens” in my life: co-workers, neighbors, people who go to my church. Many of them are potential friends in waiting, right? 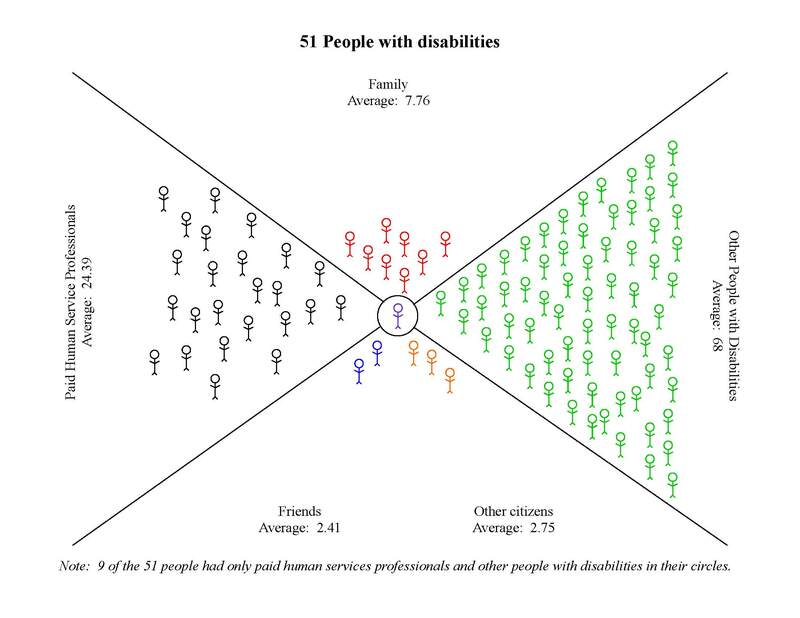 So for me (and most people without disabilities), this part of the graph is filled….packed!…with people! There’s a stark contrast between those images, huh? We can personally think of this section of the graph in two ways: Do we have any friends with disabilities in our lives? 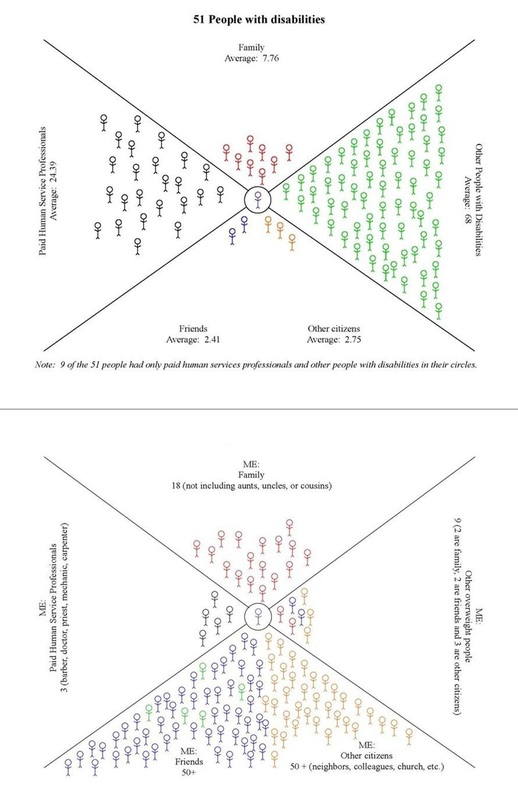 In my graph, I chose to count five close friends that have the label of disability and put them in the “friends” section. They have spent time at my house, and me theirs. Our families know each other and we see each other in many different places and on some holidays. Most people without disabilities do not have actual friends with disabilities (If they did, we wouldn’t be having this discussion!) They may know someone from high school, or they may volunteer at Starfire or some other place, but they don’t call them up on a Friday night, or meet up for coffee. There’s another way to look at this part of the graph. We can also think of it in terms of the segregation that is evident in the picture: We can ask how many friends we have who share our negatively perceived labels. This is why this is so very important. As parents pass away and brothers and sisters get busy with their own lives, if there’s no one else in their lives, then people with disabilities are at a serious risk of having no one else in their life who isn’t either another person with a disability or someone paid to be there. If they have crappy and/or overworked staff, they are at their mercy. If they want to do something with their lives that the paid staff don’t know about or don’t want to do, they’re pretty much out of luck. If a terrific staff moves on, who knows who might take their place. They don’t get to experience the respect of being loved for who they are. Their chance to live a good life is pretty slim. Remember how we had these two questions at the start? Well, we’ve answered the first definitively: No, this does not look like my life or most other people’s lives who do not carry the label of disability. I said the challenge was beautifully simple and sadly pathetic: Be a friend to someone with a label of disability. Do what friends do…hang out, call each other, worry about each other, make a fuss over each other on birthdays, joke with each other, introduce each other to new friends. Simple, huh? So…..what will you do about this reality? Feel free to offer up questions, thoughts or objections in the comments section if this is unsettling or confusing. I can try to answer them in later posts. This entry was posted in Uncategorized and tagged Cincinnati, community, contribute, disability, Inclusion, isolation, Jack Pealer, loneliness, open, organic, person-centered, places, project, relationship, social, Starfire, triumphs. Bookmark the permalink. So much truth here. . . .
Friends are so important to us all. I want my son, Joe, to have real friends (with or without disabilities – but of his choosing). Friends who enjoy spending time with him – not only going places but just hanging out together. Friends who know the details of his life and care if he is happy or sad. Friends that will have his back. Friends who will stand up for him. Friends who value him and NEED him in their lives. Friends like mine and yours. Instead of Joe being grouped with people who share his short-comings. I want to hook him up with groups who share his passions/interests/gifts. I want THOSE groups to be the groups from which he chooses his friends. We can do away with that East quadrant of only people with disabilities and replace it with: “people who love theater, history, re-enactments, Blue Grass music, etc.” And it will be just as full as it is now – but with people who have a REAL connection with Joe. And, too, I spend a good amount of time lately looking to Joe’s future. And I worry about how his life will be after I am gone. While I am here, I can make sure he has a great life. But after I am gone, who will support Joe, network for him, protect him, and help him belong? Who will make Joe feel needed and worthwhile? Who will keep Joe from feeling isolated and lonely? Who will help Joe get what he wants and needs? Who will advocate for Joe and make sure he has power over his own life? AND after I am gone, if there are no real friends in Joe’s life who truly care about him, will Joe be SAFE? If ‘things’ happen to him, who will protect him? Who will even know that ‘things’ are going on? From the first time I saw this chart and woke up to these truths, I have realized that the MOST IMPORTANT thing I can do to prepare for Joe’s future is to put as many REAL friends in his life as possible. Preparing for Joe’s home, job, transportation, etc., all take a back seat to finding friends for Joe in order to make sure that he is safe and living a full, happy life – even when I am not here. I think what is most interesting and surprising is that, in meeting with people who are interested in getting involved in Starfire (who do not have the label of disability) they either react in two ways to the 51 people image. They either nod and say something to the effect of “yeah, of course” as if they’ve known this for years and we’re silly people who have never thought of this before, or, those who are really listening and taking it personally, look troubled, and start understanding how backwards and strange, and different from their own lives this really is. Thank you, Tim, for sharing this here. Very cool post! Thanks Jim! Hi Aaron, you can of course use the graphics and share with others. I’ll send you a pdf in an email so you don’t have to pull from the webpage. We do have a lot of conversations with families and others too about their networks. I’m happy you said “co-learning.” We’ve found and believe that this isn’t just “disability work” but it’s truly, and has to be community work. We have used Connie Lyle O’Brien’s Pathfinding resources this year too with people after going over 51 People– really asking them to take a look at who is in a family’s life as well. One family in particular had very few friends, very few ordinary citizens, and truly didn’t know anyone anymore besides each other. It was a hard conversation and it was obvious that they were sad to see how disconnected from their community they had been. However, it was also a great opportunity for the family to start looking at ways to get involved, interests they had, invitations they hadn’t accepted, and work towards changing their own isolation. Reblogged this on DIFFERENT, LIKE YOU.. Enter your email address to follow Cincibility and receive notifications of new posts by email. What’s a conference when it’s not a conference?